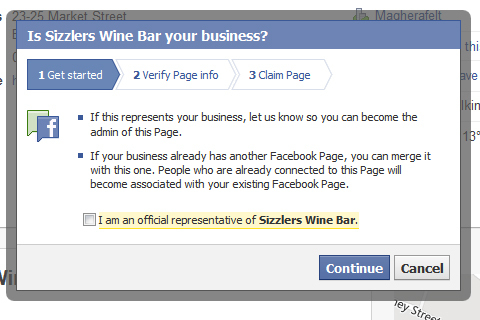 One question that I get asked regularly is “How do I merge duplicate pages of my business page on Facebook?”. Anyone who has a business were people can “check-in” often come across this problem. Mostly because users can’t find your FB page or they have spelt it wrong. But don’t stress, there is a way to claim the duplicate page and then merge it with the official page even if you are not the admin. 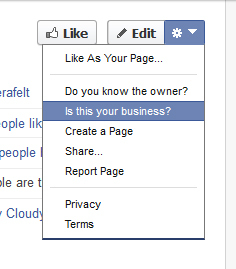 Of course, Facebook will want to make sure you are, who you are, and not claiming a page that’s not yours. Follow the steps below…. 2) Once “Is this your business?” is clicked a pop-up will appear, asking if you are the official representative of the business. Check the box and then Continue. 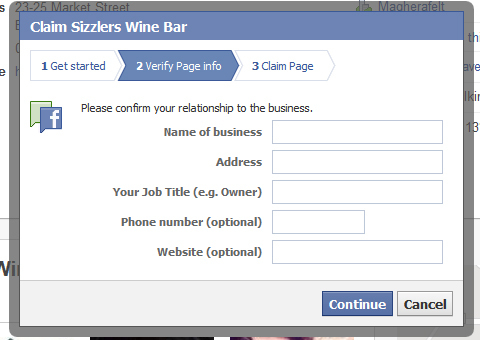 3) The next pop-up shown will ask you to confirm your relationship to the business. Fill in all the relevant information and click Continue. 4) Next, you will be asked to select the Email/Document in which Facebook can use to verify the information. Choose how you want to verify and click Submit. (For this i chose Email). 5) The last box that will show will display a dropdown box containing the email addresses connected to your Facebook account. Select your preferred Email address and click Submit. That’s it, you will receive an email with a link to verify your account……. ‘Success’ job done. Note: With the method I showed here, i was able to use an email address that includes the business’s name, (someone@BusinessName.co.uk). 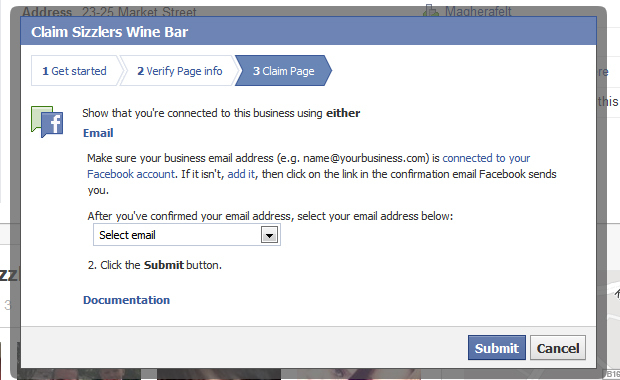 If you have a business email address, add it to Facebook. You can also use official documentation that has the business’s name, address and phone number on it. This entry was posted in Facebook and tagged Facebook, Facebook Business Page, Facebook Help, Merge duplicate pages on Facebook by Kieran. Bookmark the permalink. Hello my loved one! I wish to say that this post is awesome, nice written and come with approximately all significant infos. I’d like to look extra posts like this . My brother suggested I would possibly like this blog. He was once entirely right. This publish actually made my day. You can not believe just how a lot time I had spent for this information! Thank you! Hi there, I found your blog by means of Google while looking for a comparable topic, your web site came up, it seems great. I’ve added to my favourites|added to bookmarks. It’s actually a nice and useful piece of information. I’m happy that you shared this helpful info with us. Please keep us informed like this. Thanks for sharing. I just want to mention I’m all new to blogging and honestly liked this web-site. Likely I’m planning to bookmark your site . You amazingly come with good article content. Thanks for sharing with us your webpage. Hi, I stumbled upon your site via Bing all the while trying to find a related topic, your web site showed up, it appears to be good. We have combined with favourites features|combined with my personal bookmarks. Heya i am for the first time here. I found this board and I in finding It really useful & it helped me out much. I am hoping to give something again and help others such as you helped me. Spot on with this write-up, I really believe that this amazing site needs a great deal more attention. I’ll probably be back again to read through more, thanks for the information! Astounding job, you really helped me understand this topic with ease. Theгe’s certainly a great deal to learn about this subject. I really like all of the points you have made. I just want to mention I am newbie to blogging and site-building and honestly liked this website. You actually have awesome article content.